Do you get to the end of the day and feel like lasers have been pointed at your eyes all day? If you’re like many people and spend your time working in front of a computer, sending texts on your phone during lunch, checking Facebook during breaks, and watching TV at home, exposure to all of these electronic devices can be a huge strain on your eyes. In fact, according to a survey completed by The Vision Council, just over 60 percent of Americans report symptoms of digital eye strain. 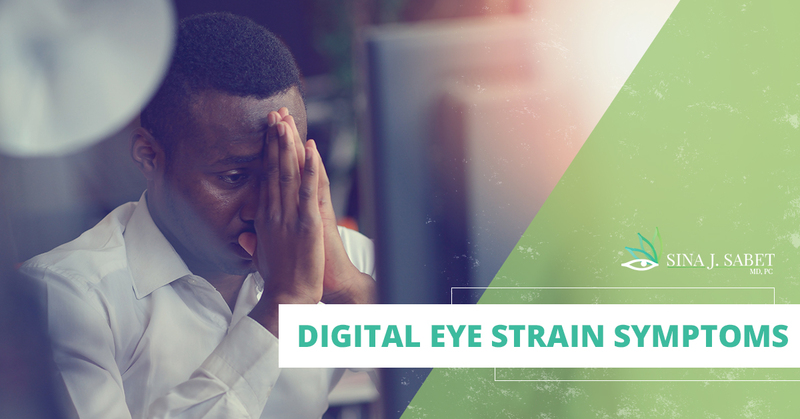 Keep reading to learn more about digital eye strain and get in touch with an eye doctor in Alexandria today if you are experiencing symptoms. What are Symptoms of Digital Eye Strain? While these symptoms can often dissipate shortly after someone stops using electronic devices, some can experience continued symptoms, leading to reduced visual abilities, such as blurred vision. If care isn’t taken to prevent symptoms, the condition can become worse. If you are experiencing symptoms, schedule an appointment with an Alexandria eye doctor for treatment. This may seem like an obvious question — the cause of digital eye strain is looking at electronic screens for long periods of time. But there is more that goes into it than that. Digital eye strain can develop due to the way text appears on the screen rather than in a book or magazine. Letters on a screen are often not as precise or clear. The contrast between the letters and the background is lower. There may be a glare or reflection on the screen that makes it hard to read. focus and move the eye. Minor vision impairments can increase the discomfort and cause performance to suffer. Those with glasses or corrective lenses often tilt their heads or get closer to the screen because their prescription isn’t suitable for viewing a screen. If you spend two or more hours using a computer, you have a higher chance of developing digital eye strain. 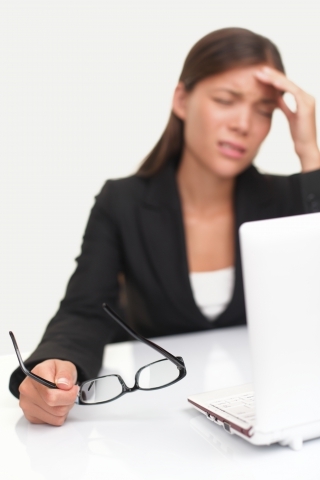 In many cases, digital eye strain can be decreased with a regular visit with an eye doctor and regular eye care. It’s often recommended that you get glasses that are designed specifically for computer use. Both glasses and lenses can have special tints or coatings to increase comfort. In special circumstances, vision therapy may be needed, which involves training the eye and brain to work together to improve visual abilities. 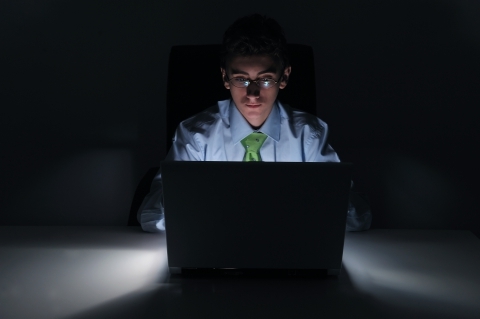 Often, digital eye strain treatment comes down to how you are viewing the computer. The middle of the screen should be between 15 and 20 degrees below eye level, or about four or five inches. The screen should be 20 to 28 inches away from the eyes. Reduce glare from overhead lighting or windows by repositioning the monitor. If glare isn’t reduced to a comfortable level, consider a screen glare filter, which reduces the amount of light reflected from the screen. Your feet should be able to lay flat on the floor, arms should be at around a 90-degree angle, and your wrists should not rest on the keyboard while typing. We’ve gone over this in past blogs, but it’s always a good idea to refresh this rule. Every 20 minutes, take a 20-second break to look at something that is 20 feet away. This will help your eyes relax and will give them an opportunity to refocus. If you’re one of the many Americans who work in front of a computer all day, it’s essential that you are familiar with digital eye strain symptoms and methods of treatment. If you have experienced discomfort and it is not going away, visit with an Alexandria eye doctor today. The ophthalmologist, Sina J. Sabet is highly experienced and offers compassionate care to each of our patients. We are passionate about everyone’s eye comfort and overall health. If you’re new to our office, download our new patient forms and schedule an appointment with our Alexandria eye doctors today. We are located Duke Street, just east of the Shell gas station. If you have trouble finding our office, please give us a call for more specific directions.